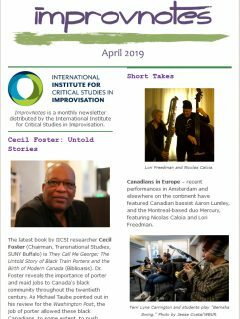 ImprovNotes is the International Institute for Critical Studies in Improvisation’s monthly newsletter. It features a range of news including artist profiles and quotes, calls for papers, and features on IICSI projects, among other news related to improvisation research and performance. If you have news or events that you think should be distributed as part of our monthly newsletter, please send it to [email protected]. The ImprovNotes readership is ever-growing, and we want to let our readers know what’s going on in the international world of improvisation. Please send us your news, photos, and links! The deadline for submissions is the eighth of the month; ImprovNotes is published around the middle of each month. Please send your submissions to [email protected]. ImprovNotes was initially distributed in 2008 as a quarterly newsletter. From June 2011-September 2014 ImprovNotes was written and assembled by PhD Candidate Paul Watkins. As of October 2014, the newsletter is written by David Lee (School of English and Theatre Studies, University of Guelph) and assembled and distributed by IICSI administrative assistant Rachel Collins.